Sidney Young is a disillusioned intellectual who both adores and despises the world of celebrity, fame and glamor. His alternative magazine, Post Modern Review, pokes fun at the media obsessed stars and bucks trends, and so when Young is offered a job at the diametrically opposed conservative New York based Sharps magazine its something of a shock! It seems Sharps editor Clayton Harding is amused by Young's disruption of a post-BAFTA party with a pig posing as Babe. Thus begins Sidney's descent into success - his gradual move from derided outsider to confidante of starlet Sophie Maes. Initially helping him out at Sharps is colleague Alison Olsen, who has her own secret. Wither their friendship? Taglines: The most hilarious comedy of the year. The scene where Sidney asks an actor "Are you gay?" is based on Toby Young doing the same to Nathan Lane regarding his role in The Birdcage. Continuity: Alison vomits in Sidney's lap while in the car on the way to Sidney's apartment yet when they arrive his pants are perfectly clean. Sidney Young: I sent the fish, you know, goldfish in a bowl. Did she get them? Sophie Maes' Assistant: Yes, but they were dead! Sidney Young: All of them? Sophie Maes' Assistant: Yeah, it was kind of shocking actually! Were they dead when you send them? 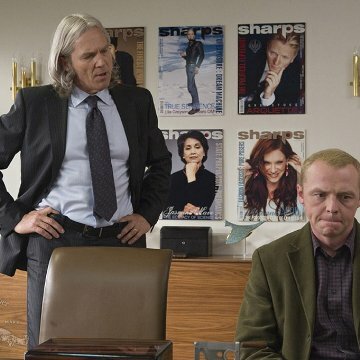 Sidney Young: No no, who sends people dead fish? Sophie Maes' Assistant: The Mafia? 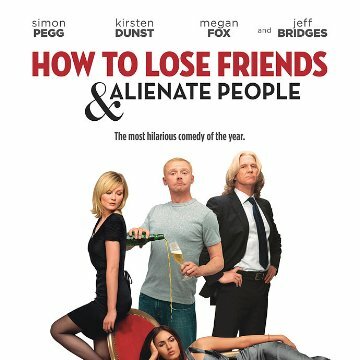 How To Lose Friends And Alienate People looked like it might be different to the average rom-com we get these days, it looked like it was going to be a smart and satirical look at mainstream Hollywood. It isn't and it wasn't. It's in exactly the same vein as Run Fat Boy Run. I'm not saying that it's a bad film because it isn't and neither is Run Fat Boy Run, but I just felt like I'd seen it all before. The start was rushed and lacked that flowing feeling. The middle was the best part, with a couple of laugh out loud moments. The end was a walking cliché which came straight from the school of Cameron Crowe (once again not always a bad thing). 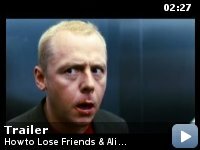 Simon Pegg stuck to his normal schtick when he's without Mr. Wright and Mr.Frost, playing the lovable but overall clumsy fish out of water Brit. Jeff Bridges was and still is The Dude so he can do no wrong. Kirsten Dunst stuck to her guns and Megan Fox was thrown in as the so hot at the moment crumpet. An entertaining film. Not bad. Not great either.